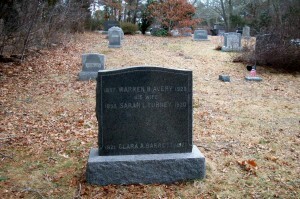 Died: January 23, 1920 in Bourne Ma. at 67 yrs, 1 mo, 9 d.
2. Clara Elnora Avery Barrett; (December 25, 1882 – March 16, 1969); Married Jay Lockhart Barrett (1883 – 1959) (Wilburn L. Barrett & Elizabeth McGrath) in Great Falls Mt. 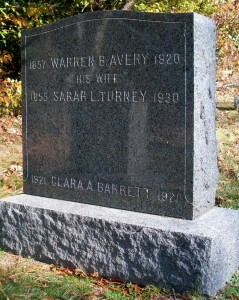 on December 24, 1920; Clara was a member of Bourne High School Class of 1902; Clara & Jay’s daughter Clara Avery Barrett (October 16, 1921 – October 19, 1921) is buried in Pocasset Cemetery; Clara & Jay died in Los Angeles Ca..
3. Mamie Wales Avery Whipple; (December 31, 1886 – April 5, 1919); Married Oscar Linwood Whipple (1885 – 1954) (John Clarence Whipple & Mary E. Manimon) in Wareham Ma. on December 2, 1915; Oscar married (2) Marion (Bassett) Johnson (1899 – 1986) (Charles Marquett Bassett & Josephine Harding) in Bourne Ma. on December 19, 1924; Marion married (1) Albert Johnson in Bourne Ma. 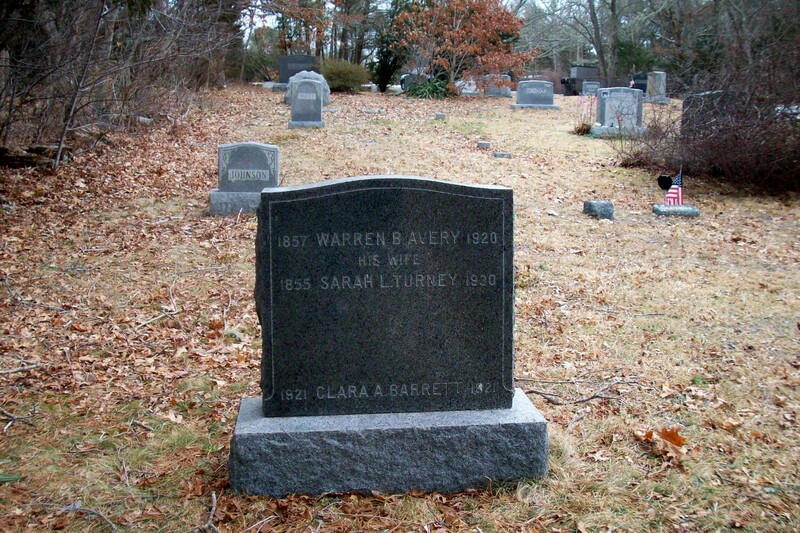 on July 22, 1916; Mamie was a member of Bourne High School Class of 1906; Mamie, Oscar & Marion are buried together in Oakland Grove Cemetery in Bourne Ma..
4. Edward Warren Avery; (1889 – January 9, 1921); Married Elsie Ellis Perry (1890 – 1936) (George Washington Perry & Maria Katherine McLaughlin) in Bourne Ma. on October 28, 1914; Elsie married (2) Walter Everett Raleigh (1878 – 1962) (Charles Sidney Raleigh & Amelia/Aurelia Eva Stevens) in Bourne Ma. on December 28, 1924; Walter married (1) Florence R. Allen in Bourne Ma. on March 29, 1899 & married (2) Evelyn E. Mailman (? – 1924) & married (4) Alice M. (Austin) Spencer in Bourne Ma. on February 27, 1937; Edward was a member of Bourne High School Class of 1908; Edward & Elsie are buried in Oakland Grove Cemetery in Bourne Ma..